Cucumber (khira/kheera) is an excellent crunchy vegetable to beat the scorching summer heat. Cucumber varieties are vary in size, shape, and color but mostly it is found with dark-green skin, moisture rich pulp, crunchy flesh, and small edible seeds in center. Fresh cucumber can be eaten raw, with vegetable salads or you can also consume its juice. This low calorie curvy vegetable has a high water content that helps keep your body hydrated and the low calorie content makes it a great choice for a weight loss diet plan. It contains no saturated fats or cholesterol. Cucumber comes with good amount of Vitamin K, C and manganese, potassium, zea-xanthin and lutein and beta-carotene. 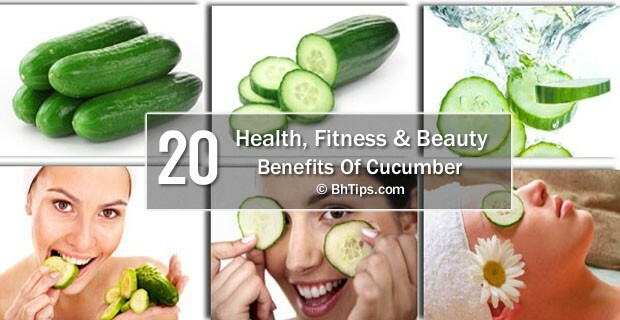 Let's have a look on some best health, fitness and beauty benefits of cucumber. According to recent studies, lariciresinol, pinoresinol, and secoisolariciresinol found in cucumber are very helpful in reducing the risks of developing breast cancer, prostate cancer, ovarian cancer and uterine cancer. In addition, Cucumber peel is a good source of dietary fiber that offers some protection against colon cancers by eliminating toxic compounds from the gut. The high water content and dietary fiber in cucumbers are very helpful in elimination of toxins from the digestive system and hence helps in digestion. Many digestive problems like acidity, heartburn, gastritis, and ulcers can be cured by consuming cucumber on a daily basis. Cucumber fiber content adds to your bowel bulk and relieves constipation. Cucumber peels are rich in dietary fiber that helps reduce constipation. Chronic digestion can be cured by regular consumption of cucumber. Cucumbers are very beneficial for treatment for diabetes. Cucumber juice contains a hormone that is required by the beta cells of the pancreas to produce insulin which has been found to be beneficial to diabetic patients. Consumption of few cucumber slices before going to bed is considered very effective to cure morning hangover. Vitamins and electrolytes in the cucumber reduce the intensity of the hangover and the headache associated with alcohol intake. Note: It is best to avoid alcohol as it is hazardous to health. Cucumber is also considered very helpful regarding bone strength. Vitamin K in cucumbers has been found to have a potential role in bone strength by promoting osteotrophic (bone mass building) activity. In addition, Cucumber contains a good amount of silica that promotes joint health by strengthening the connective tissue. Regular consumption of cucumber maintains the blood pressure in your body at the optimum level. Cucumber contains a good amount of Potassium that neutralizes the effects of sodium in the blood and helps maintain electrolyte balance as well as helps a lot to maintain the overall blood pressure within normal range. Potassium along with magnesium and fiber also helps to treat both the low and high blood pressure. Cucumber is considered very effective in getting rid of dark circles under eyes. Cooling properties along with antioxidants and silica present in cucumbers not only help rejuvenate the skin but also reduce dark circles under and around eyes. All you need is to follow the given instructions. Take two thin cucumber slices and place on your eyes. Let them stay on your closed eyes for 15-20 minutes. Finally remove them and wash your eyes and surrounding areas with fresh water. Alternatively You can also apply cucumber juice on your eyes according to given instructions. Dip two cotton pads in some cucumber juice. Now remove them and wash your skin with fresh water. Cucumber is also very beneficial to cure tired and puffy eyes. Ascorbic acid and caffeic acid in cucumber brings down the water retention rate and diminish the swelling and puffiness around the eyes. To get rid of eyes puffiness you need to follow the given instructions. Take two cucumber slices and cool them in refrigerate for a while. Now place them on your closed eyelids for 15-20 minutes. Finally remove them and wash your eyes. Cucumber is helpful to cure the problem of dull and rough skin due to its high water content. Cucumber contains 95 percent water that hydrates and replenishes the body by eliminating the toxins. Rub your skin with fresh cucumber slices. After 15-20 minutes wash off with fresh water. It will deeply hydrates your skin and will give you smooth and fresh skin. Natural skin bleaching properties of Cucumber are very helpful in getting rid of sun tanned dark skin. You can increase the skin bleaching effect of cucumber juice by adding some lemon juice according to given instructions. Take 1 tablespoon of Cucumber juice and mix with equal amount of lemon juice. Apply this mixture on sun tanned dark skin. Finally wash off after 15 minutes. For best results, repeat this process on a daily basis until you get the desired results. Natural cooling and skin soothing properties of cucumber are very beneficial to treat sun burnt skin. Follow the given instructions to treat sun burns. Take some cucumber pulp and add some aloe vera gel to make a fine paste. Apply this paste on sun burnt skin. Let it stay at least for 15 minutes and then remove. Cucumber juice acts as an excellent skin toner. It not only helps in cleansing of open skin pores but also acts as an astringent and close large open skin pores. In addition, it helps to improve a dull greasy complexion. Take some cucumber juice and apply all over your face and neck. Finally wash off with cold water. Manganese and potassium in cucumber help a lot to firm up skin and rejuvenate skin by reversing signs of aging like wrinkles and fine lines. You can make a skin rejuvenating mask of cucumber by mixing some egg white and lemon juice. Take 1 tablespoon of cucumber juice, 1 tablespoon of lemon juice and one egg white. Mix them well to make a fine paste. Apply this paste on your face. Wash off after 15 minutes. Cucumber juice is very beneficial in getting rid of freckles, acne scars and blemishes. You can simply apply fresh cucumber juice on affected areas. Alternatively you can make a homemade pack by following given instructions. Take equal quantity of cucumber juice, lemon juice and mint juice. Mix them well and apply on your face to reduce the appearance of freckles, acne scars and blemishes. After 15 minutes wash off with fresh water. Besides this, regular consumption of cucumber also helps a lot to expel toxins from body. High water contents and toxins removal ability of Cucumber is very helpful in getting rid of cellulite. Phytochemicals in cucumber also aids in the production of collagen, the fiber-like protein responsible for skin elasticity and remove cellulite. To enhance the cellulite fighting ability of cucumber you can add some ground coffee and raw honey according to given instructions. Take 2 tablespoons of cucumber juice and mix with 1 tablespoon of ground coffee and 1 tablespoon of raw honey. Now mix them well and apply on affected areas. Now wrap it in a muslin cloth and exfoliate gently after 30-40 minutes. Skin bleaching properties of cucumber are very beneficial in lightening dark skin tone. According to given instructions you can make a skin lightening pack. Take 2 parts cucumber juice and 1 part lemon juice. Mix them well and apply on your face and neck. Let it stay for 15-20 minutes and then was off with cold water. Phytochemicals in cucumber kill the bad breath causing bacteria. To get rid of bad breath you need to follow the given instructions. Take a slice of cucumber and press it to the roof of your mouth with your tongue. Press it for 30-45 seconds. By doing so will help to kill bad odor causing bacteria. Regular consumption of cucumber not only helps in getting rid of bad breath but also keeps gums healthy. Cucumber is highly beneficial for hair. The silicon and sulfur in cucumbers help to stimulate hair growth. For healthy and shiny hair you can follow the given instructions. Apply cucumber juice to your scalp and hair. Wash it off with your regular mild shampoo. To repair dull and damaged hair you can make an excellent hair mask with Cucumber, olive oil and egg by following given instructions. Take one egg, 1/4 peeled cucumber and one tablespoon olive oil. Put them to blend in a mixer. Once you get a fine mixture, apply it on the scalp and all over your hair. Leave it for 10-15 minutes and wash off with mild shampoo. Cucumber aids in weight loss. High water contents and low calories in cucumber make it an excellent food choice for weight loss. You can eat cucumber along with your regular meal or consume as a snack between meals. By munching on low calorie vegetables like cucumber make you feel full on fewer calories, helping you eat less throughout the day.